Dr Ken Loi is a specialist Upper Gastrointestinal Surgeon with appointment at St George Public and Private Hospital, Kareena Private and Sutherland Public Hospital. He has performed more then three thousands advance laparoscopic surgery include primary and revisional bariatric operations. He has studied extensively about Bariatric surgery since 2002 and advance his experience from USA and Australia. Currently he hold position as Honorary Treasurer of OSSANZ (Obesity Surgery Society of Australia and New Zealand) and also in Education and Training position in IFSO - International Federation of Obesity Society ( Asian-Pacific chapter). Has also has numerous publications and been invited speaker for local and international meetings. Since 2003 Dr Ken Loi has been involved in setting up Multi-displinary surgical weight loss programme in St George Private Hospital and also from 2009 in Sutherland Public hospital for (SESAHS - South-Eastern Sydney Area Health Service). He has performed more then thousands of Bariatric operation with good result and minimal complications. Currently he hold the advisory role with DoHA (Department of Health and Ageing) in facilitating new Bariatric surgery item number classification and NCCC (National Case-mix Classification Centre) in funding for bariatric surgery. 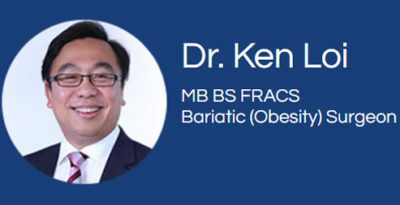 Besides bariatric surgery, Dr Ken Loi also has extensive experience in Advance Upper Gastrointestinal Laparoscopic surgery include hernia surgery and oncology surgery and also Endoscopy.